Don't Knock on the Window! I have no clue what the first line has to do with the second line. Were people knocking on the window to get into the building? 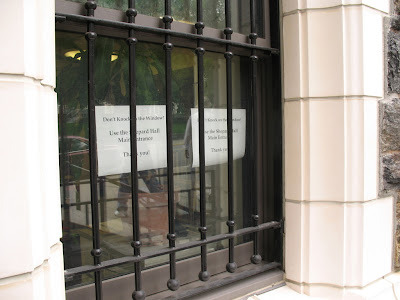 Do they want you to go in the main entrance in order to knock on the window? What motivated them to put up this sign. I'm certainly stumped. 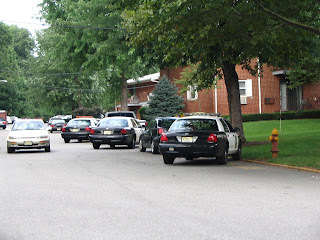 Just so this is clear Highland Park is known for having a ton of cops for a town thats around 1.5 square miles. Gotta love California . 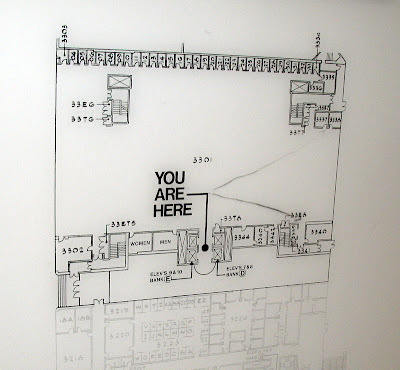 . .
As I traipsed through the stacks I discovered the book's nursery! 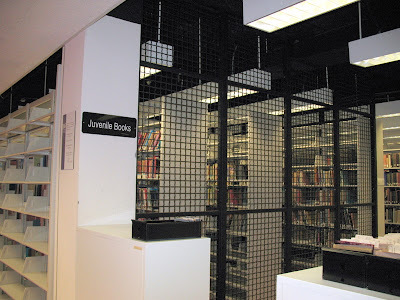 Undoubtedly to shield them from predatory water fountains, juvenile books are kept safely in a protective cage. In all seriousnesses, for a moment: For the life of me, I can't figure out why the kids' books are left essentially inaccessible (there's one place in the stacks where you can squeeze in). In the Sunday comics there is comic called Slylock Fox, in it there is Slylock Fox a Sherlock Holms wannabe. Every week there is some mystery that he has to find the solution to, and he can do this based upon something in the comic frame. You are supposed to guess what the solution to the mystery is. They tend to be very stupid with even stupider solutions. This week’s comic was utterly stupid because the solution was correct but in my mind there is an even bigger flaw. Have you seen it yet, that’s right the picture of the nastily guy on the moon has stars. Now if you are on the moon with shadows being cast, you must be on the day side and if you are on the day side taking pictures for daylight exposure stars won’t show up. Stupid cartoonist we must all spam him with complaints about this massive inaccuracy, or he can admit that he took the picture on a sound stage with stars glued to the ceiling and then photoshoped the nasty guy into that. 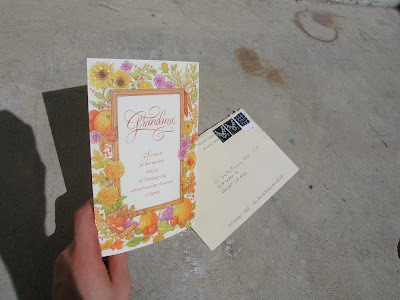 Then I got this happy thanksgiving card for a grandma with the note "I'll bet you thought that other card was the real one"
That's right: 92.9 miles, 29 hours and 41 mins straight of walking. Holy cow! Quite a bit out of the way, methinks. Elizabeth is close to 25 miles away by car, and, in reality, it shouldn't be that much further by foot. 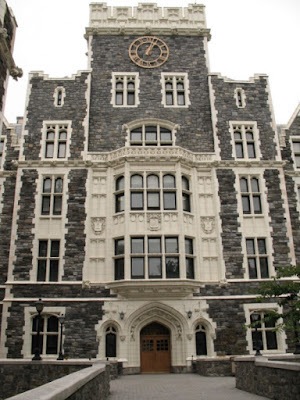 However, Ask suggests a 233.7 mile, 3 day, 2 hour and 48 minute nonstop trek, taking you to Bear Mountain State Park in the Catskills, past NJ's awesome zinc mines in Franklin and Ogdensburg, at times bringing you within 18 miles of Pennsylvania. And with all that, it doesn't even avoid Newark! 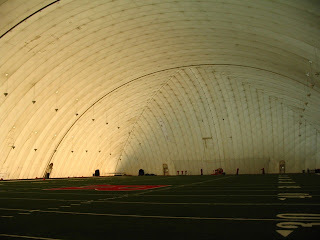 Today I did a bit of exploring; I visited the Rutgers Sports Bubble. Now I am sure that you all have seen those big inflated white bubbles used for sports, but do you know how they work. 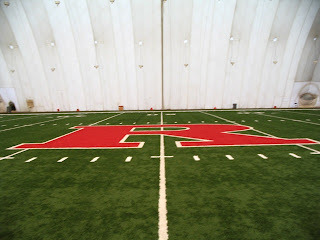 Well until today I always figured that it was two skins that were then inflated, well today I learned that the Rutgers one is not like this. 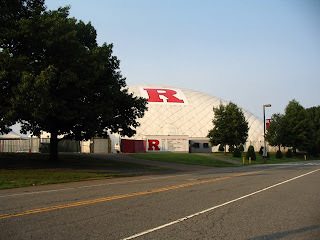 The Rutgers bubble is actually a single skin, its shape is made from the metal wire framework around the outside (which give the bubble the weird patterns that I always figured was just where the different pieces of fabric sown together) and the inside is totally pressurized. 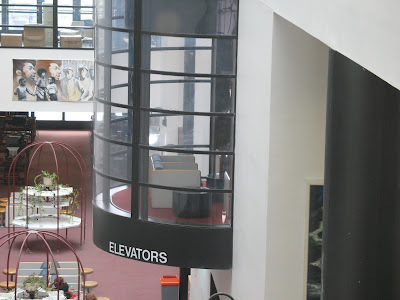 When you walk in there is a revolving door that is quite difficult to open (I assume this is due to the pressure differential) then you get in and your ears pop. 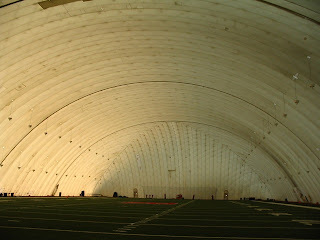 Totally cool, an enormous enclosed area with a football field in it. This is the view right when you walk in. 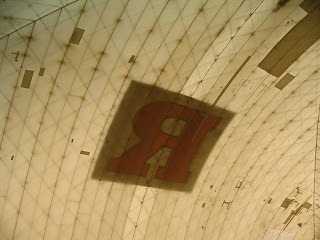 There is the big R from the inside. The R up close, on the sides of the picture you can see the two air ducts that pressurize the bubble (you would only need a small increase over atmospheric pressure. You would only need pressure a little greater than the wieght per square foot of the skin and metal wire, somewhere around one PSI probably). Let's see suggestions in the comments for the subhead. My suggestion: "EZ Pass soon to be accepted at discounted rates." Some time ago I became curious about my grandfathers military service. I got a bag full of pins and medals from my grandmother (she gave the bag to Yoni who passed it on to me), however we believe that she has throw out hit uniform so some information was missing. 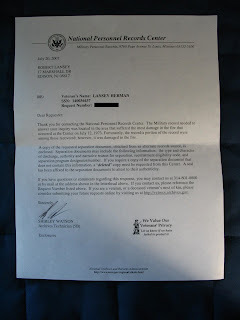 I started searching on the internet to see if I could find any information, I was lucky and managed to find his enlistment records. 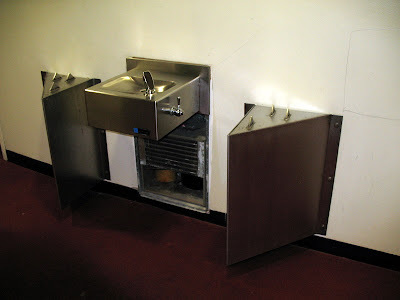 From that point on I followed some links and found some formwork to send in to the national archives for his records. My father and I filled the form out. 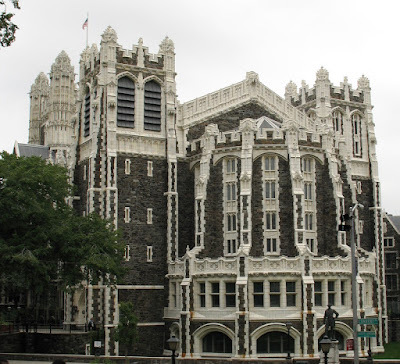 A couple of weeks later I got a letter back from the archives; it basically informed me that unfortunately his records had been in the part of the archives worst damaged by a fire in 1973. 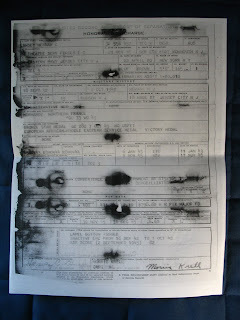 They did save his honorary discharge paper, from this I managed to fill in some of the gaps and have documentation to back up what my grandfather had told me years ago. 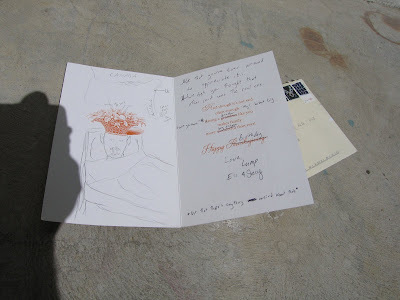 The letter from the Archives. My grandfathers slightly crispy honorable discharge paper from which I learned that he was a Staff Sergeant and that he served in Normandy (he went on to the beaches around two days after D-Day), and in Northern France. Here are the medals and pins and stuff. 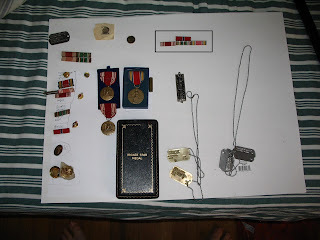 In the boxed in section on top, is his army ribbon rack as my research would indicate it would have appeared on his uniform, on top is a ribbon for his Bronze Star (which is in the un-opened black case at the bottom), and then the bottmo row, from left to right, Good Conduct Medal ribbon (the medal is the one with an eagle on it with the ribbon above it having the same color scheme as the ribbon), European/African/Middle Eastern Campaign ribbon (with to stars shaped pins in it for the two campaigns he was directly involved with), and the WWII Victory Medal ribbon (the medal is to the right of the ones for good conduct). In the bottom left corner are two pins one that has US on it and the other has a shield this indicated that he was attached to the Adjutant Generals office. Above the extra ribbons is a round pin with a duck on it this is an honorable discharge lapel pin (called the ruptured Duck). In the top left hand corner is a dog tag with the name Herman C Lazinsky (my grandfathers nae before he changed it). In the bottom right are two sets of dog tags the ones on the right are my grandfathers and the ones on the left are my grandmothers (she worked for the US army as a civilian after she married my grandfather in England). 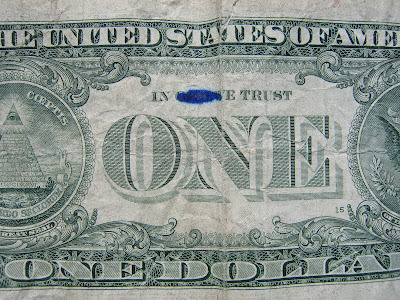 You can also see a 5 cent F.D.R. stamp and a 9mm casing that I believe is from a Smith & Wesson M&P. I'm not sure why, but Google decided to target market me into "More about . 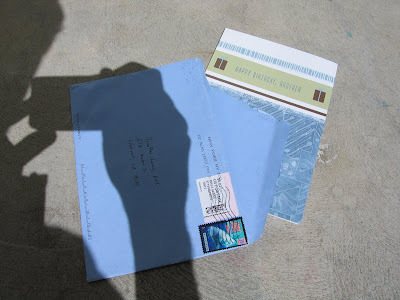 . . Sabbbath" while reading a gmail email about nothing at all related. Automate everything for only $49! Lights, Oven, Radio, and more. On the store's cute little sign there is a bizarre statement: I have no idea what a "Specially Delicious House" is. After some searching, it appears that this might be a restaurant. 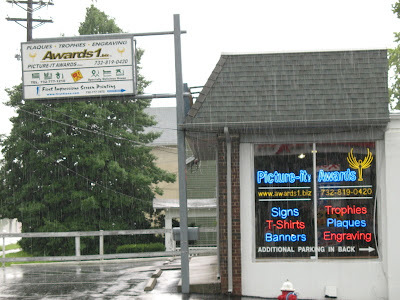 However, a restaurant in a awards, engraving and T-shirt printing store seems a bit strange. If it is, in fact, a restaurant, I wonder what "Specially Delicious House" is supposed to mean.